If you are into the blogging world for some time already, you surely know that having strong connections are everything. There are many ways to build relationships online, as via blog commenting or social media. One of the most effective methods to improve your audience is participating in blogging communities. I am sure you are member of many of them, but in this post I want to introduce you a special place: Aha!NOW blog community(ABC). ABC is founded and managed by a kind and open minded blogger, Harleena Singh, together with her husband, Vinay. It’s composed by bloggers of all around the world, who want to engage, share and learn by each other. If you want to become a “Ahaian” too, be sure to register now at Aha-Now blog community. Choose your username and create your account. Confirm your email, and be sure to complete all the settings in your profile. Add your website URL, and your social media profiles : Facebook, Google+ and Twitter. Write your full name and personal information like your bio, location, profession, favorite niche and birthday date. Basically, you want to have your account as more complete as possible : a 100% profile progression! Once you have done this, if you take a look at the top right of the page, you will see your account menu. Here you can manage all the activities on ABC, such as your AhaPoints or AhaREF balance, any notifications of friendship request or mention, new messages, groups and forum news. Finally, if you take a look at ABC top page, you will notice the “Community” menu, which you can browse to navigate within the site and engage with other members. It’s not so hard to understand how ABC works. You’ll soon realize it’s like being at home, among family or friends. 10 – get new visitors and readers. Other than that, if you end up being one of the most active and engaging community users, you will be mentioned in the monthly “Member Spotlight” (GEMS) post. Plus, if you rank in the top members at the end of the month, you will have the opportunity to guest post for ABC, which will give you particular exposure. After that, you can create your own group, a place where you can talk about what you feel more expert in, helping you build authority in your field. For everything you do on Aha-Now blog community, just consider to be yourself, honest and real. Don’t join ABC just to promote your content on the groups or forum (after all, there is a specific place for doing that). Consider ABC like your own blog, your home. A place where you want to genuinely engage and interact with other members, in order to learn from each other and build long lasting relationships. I am sure you already use blog commenting as a method to get traffic, new backlinks and increase your audience. The same works at ABC. Visit new blog posts, leave meaningful comments and interact with members. This will increase your score activity at ABC (visit here to read the site guidelines). This is one of the feature of ABC you are going to love. Visit the forum, under the “promote your blog” section, to create a new post and market your articles. Do not submit content older than one week and be sure to visit and comment other members websites, before submitting your new posts. After all, this is a community. It’s about giving at first, then receive. This is the core of ABC. Interact with other members, improving your connections. You have the chance to get to know new people, who share the same interests. You can join groups and participate in the discussion, sharing your knowledge about the topics you like most. 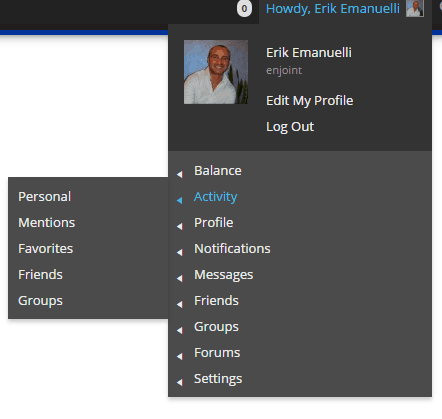 Or you can engage within the forum, with its specific sections. As for anything online, you need to follow the site guidelines. Basically, if you behave like a “real” person, you don’t need to worry about being banned. If you are honest and you already know how to “be social“, you don’t even need to read the rules page. But of course, under the ABC menu, you will find all the pages you need to visit to be a good “Ahaian“. Also, if you subscribe to the site newsletter, you will be always notified about updates and announcements. I’ve been a member of Aha-Now blog community since last year and I must say I got so many benefits, that I strongly recommend you to join. Harleena and Vinay are doing a fantastic job there and I am sure you will enjoy the cozy atmosphere of this community. Most of all, if you are kinda new in the blogosphere, it’s the perfect place to start building your name and new connections. Are you already an ABC member? I read someone saying on G+ that he will lose his identity if he joins Aha!Now but rather I think I got my identity from Aha!Now itself. I think, Aha!Now is the best blogging community because no other community is as welcoming and nice as Aha!Now is. I have signed up for Indi*******[dot]com and Ki***d[dot]com but I didn’t fins any welcoming or interesting factor which could have kept me active there. You’re right about other communities. It’s all about how they are managed. where the owner claims is spending a huge amount of money to promote it. But there is something that can’t be purchased by money. It’s the feeling of being at home, with friends. And Harleena and Vinay accomplished to create that atmosphere. Thanks for leaving your thoughts, Rohan. Yes Erik, I read that the owner is spending too much to promote it. But still I didn’t see any effects. The pop-ups over and over again, the slow and lagging site, lastly the admins and mods having not-wanna-reply-to-irrelevant members attitude is not acceptable. They should remember that everyone will forget what they said, but will remember how they made everyone feel. what’s the ROI? And when? I should invest all that money in a different way!!! I’ve my small blogging community (http://www.klinkk.com/), which is going good. And I don’t have rush to excessively promote it or spend money on marketing. Backlinks are flowing naturally there! I agree also on admins and mods behaviour on “that platform”. I feel a sort of arrogance I don’t like, honestly. Glad you share my views. Thanks for your response here. Unfortunately, I don’t have a lot of time to invest there. comments on stories, help users for requests, etc. But I see things are going pretty good. As mentioned, backlinks are flowing naturally, bloggers are mentioning Klinkk as a blogging community to join and to promote posts, which is great! It has potential, let’s see in future. I love this post as I am a member of this splendid community. I really thank to Harleena Mam and Vinay Sir, because without ABC I wouldn’t get acquainted with awesome bloggers like you. I got a handful of best buddies. No doubt that this is the most active community in the blogosphere. I was (is) a regular visitor of Aha-Now! Hence I got to know about ABC and Harleena Mam also recommended me to join in. So I did. And I am sure, that was the most accurate decision I took online ever. Thank you so much for the awesome review sir. As an Ahaian, I can say that you touched all the awesome spaces of the community. Keep going sir. Keep us inspired by your words. as it’s a great chance to connect with more bloggers. talk to you soon, Rahul! Hi Erik, this was a pleasant surprise! Thank you so much for writing about and introducing the ABC to your blog readers. I really appreciate it. You’ve got it all right – basically, the ABC is about developing relationships and evolving as a blogger. It’s not merely a promotion platform (we do provide blog promotion features) as there are many other blogging communities for that purpose. The ABC instead has become a second home for bloggers and non-bloggers alike. As with the Aha!NOW blog, the ABC was build on the founding principles of helping, sharing, and caring. We are a community in the real sense, in that we all members are closely bonded and there for each other as a family. That kind of bonding helps to create a conducive environment for learning and growing. At the ABC, we are working towards empowering the members so the time they spend on it is helpful, meaningful, and useful. Thanks so much for this fantastic review of the ABC. Thanks for your personal recommendation and I guaranty to deliver them. If anyone has any questions, they can ask here in the comments, ask Erik, or contact us through the contact form at Aha!NOW. Have a great week ahead! it was my pleasure to write a post showcasing the features of your awesome community. you created with ABC a great place for bloggers. A meeting point to learn, share and create new connections. Like being in your own blog, or at home. And congratulations again for accomplishing that. I’m sure Aha-Now blog community will keep growing very fast! have a great week and keep up the fantastic job! You know so much more about the ABC than we do! 😉 Awesome write-up about the ABC. I’d say it’s got everything that a blogger could ask for. It’s been only six months, but we received an overwhelming response from bloggers globally. It’s truly an International community, and you’d find the most wonderful and best persons here. Harleena has written all that I wanted to say, but I’d just add a bit of information like you can also register and login using the social logins. That makes the process smooth and fast. As soon as you register, you receive a welcome mail, and you can follow all that is mentioned there to make the most of the ABC. We have plans to introduce more features in the ABC that would enhance the engagement and help create more contacts and relationships. For us, all “Ahaians” are gems – they are precious. We want all of them to become top and successful bloggers. We want to help them in all possible ways. Yes, the ABC is free, and with time, it’s going to be more giving! You’re so right that the interactions and engagement is at the core of the ABC. Eventually, this gives you more returns than mere promotion of your blog post links. After all, blogging is all about relationships, and a real community needs to help you in that aspect. We have a set of guidelines in place to be followed by all the members. For instance, all members are required to present their true identity, which includes their name and photo. This helps us create a safe and secure environment that is completely free of spam. Wow, you accomplished so much in that little time. ABC is a second home for bloggers and Ahians. That’s why I created this post. To suggest every of my readers this awesome community. and for visiting here, leaving your views. You can’t be wrong writing about ABC. One very solid point for this community is Harleena and of course her partner. I think she thought well to have put up such a community. I can’t tell you I’m active on it yet but I will. I do hang around it from time to time and I love that the mods are able to keep the community selectively clean. Harleena and Vinay created such a great place for bloggers to meet and engage. You’re right, ABC is such an awesome community! I look forward to seeing you more active there. Thanks for your comment here, my friend. This very community has always expanded my knowledge and is really good and recommended. glad you had an awesome experience with ABC too. Fully agree with each word of yours and you are right to get a big boost newbie bloggers must join it as I am also comparatively new in blogging niche and getting amazing feedback from ABC. The brand image of group admin does play a big role in popularity of a community and participatory style of blogging followed by Harleena Singh is well know to all. For example if host in a party is silent and don’t like to interact with people so much then obviously his guests will also be a little acutious while going lively and vivacious. On the contrary if a host himself is so interactive and love to talk to people and be with them then all the guests will also enjoy the party a lot. Same applies ditto same to ABC where the main host is a commenting superstar who always been very kind and open to help others and that is why most of her community members love to follow her style to get the same level of success. Thanks a lot for sharing this wonderful review. ABC is a great place for new bloggers to start building connections within their niche. But it’s also an opportunity for experienced people to showcase their knowledge and build more audience. ABC is kinda new (as Vinay said, just 6 months old), but already popular in the blogopshere. I’m sure it will keep rocking! Appreciate your visit and support, Mi. Don’t have much to say as the other members have said all that I have in mind. I do want to encourage anyone who is looking for a community that is genuine, friendly and caring that you can’t miss it at ABC. Kudos to Harleena, Vinay and all the Ahaians. You guys rock and so do you Erik. I must thank you for all the support you give to my blog. 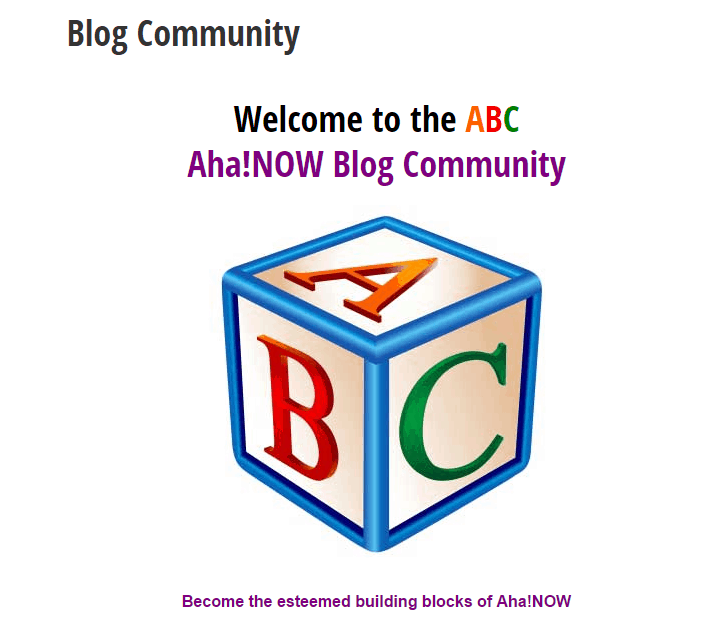 Aha-Now blog community is awesome! Harleena and Vinay, together with all the Ahians, have made ABC a fantastic place to meet and engage. I thought i would be just another thanks-giving post about ABC but you also took it to the technical ends. As Vinay sir said, it seems like you know much about ABC as much as they do. I was just an another blogger in this blogosphere till I got to know about this awesome community. When I joined it, I got a warm welcome form Harleena madam, Vinay sir and from some of the senior ABC memebers. It took no long to make me feel like a family there. ABC turned out to be one of my greatest resource of blogging connections and knowledge. I have been in news and some other’s blog for the first time in my blogging career in Members Spotlight(GEMS) post. From hen, till now and in future ABC will be helping, educating and uplifiting passionate bloggers and puts them in focus. We can take the example of one of best buddies Rohan(met on ABC) joining the ABC being a newbie have more followers now than the experienced ones. Thank you ABC for bringing us all together. Thank you Erik for giving this oppurtunity to share my love of ABC on your lovely post. 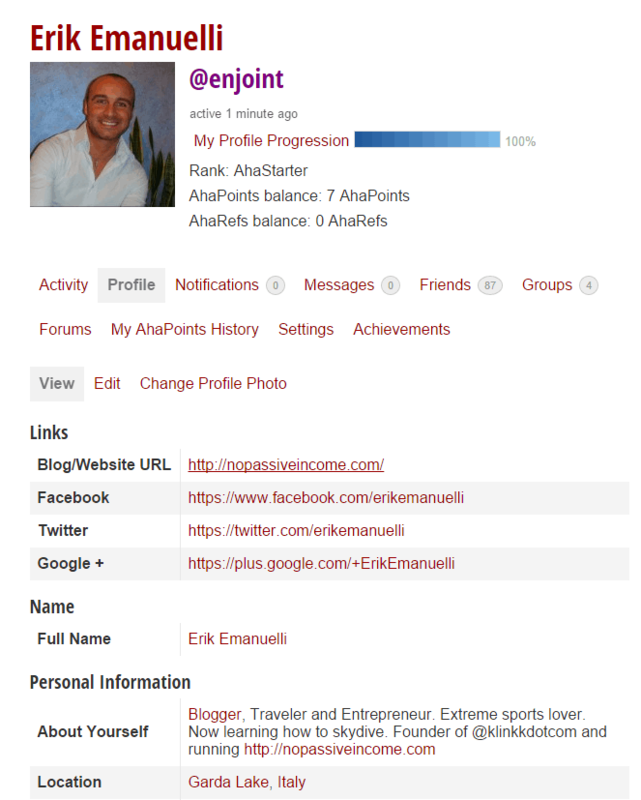 I wanted to explain all the main features of Aha-Now blog community. ABC is a great place not just for starters, but also for experienced bloggers. You have the opportunity to showcase your knowledge, increasing your audience and authority. Sharing your experience, and learning from each other. Appreciate your support and comment! Good explanatory post. I have recently joined this wonderful community and have already fallen in love with it! I also picked some tips as well as more information form your post about ABC community today. Getting more from a senior in the community is way more helpful than trying to dig for it on own. glad you liked the review of this awesome community. Everything you mentioned is true. But one particular sentence stood out the most to me is when you said, “be yourself, honest and real” Those gifts are passed down from Vinay and Harleena because it’s easy to tell that’s who they are and that’s how they live their lives. When people motives are pure with love, compassion and giving then this will always be the results: A community of bloggers who wants to see and help each other succeed. I thank you for writing this awesome post because it helps me to stay humble knowing I’m part of something special. glad you value my words. Be real, be honest, be yourself. You can really feel that sense of familiarity at Aha-Now blog community. You are part of something special, that’s the big difference! Thanks for all your support, Vernon. Harleena and Vinay are doing such an awesome job at ABC! I recommend any blogger to join! OK, I’m joining now. Don’t want to miss on this great opportunity and it’s always nicer to do it at a friends site. Congratulations on all of that! Thanks for leaving your views, Sylviane. I’m glad you visited and you learned about ABC. Now, I wasn’t sure if you had written the post, Erik, but now I think that you have. So, thank you and congratulations on not only joining but giving us all the steps to follow. Glad you liked the guide of Aha-Now blog community. Well, it seems that I’m not able to join. It says that my email is already being used, but I haven’t joined before, so I’m a bit confused. Harleena Mam is undoubtedly an Inspirational personality. She has a strong community around, I like the way She reply to the commenters and her writing style. Thanks for sharing the post about Aha-now community. Will join it now. Glad to hear you are already a member of Aha!NOW blog community. Thanks for leaving your comment, Kuldeep. Thanks for writing about the Aha!Now community, as you might know I recently joined. It was purely by accident though. Harleena had given me log-in details for the guest post I did and it signed me up to her community which I wasn’t ready to start using yet. Still not active in there due to all these home improvements I’ve been doing as well as taking my Mom to all her appointments. That’s the “spare time” I had to focus on getting acquainted in the community. I’ve been in there a few times but it was kind of confusing to me how to use. Your instructions shed some light on it for me so thanks for that. Now I think I can find my way around more when I get ready to dive in. Great share and it’s a great community so I also recommend people joining. We all want to meet new people or interact with more so what better way right! Thanks to Harleena and Vinay for devoting so much time to creating this community so others can benefit from it as well. good to hear you joined Aha-Now too. It’s great to have you as member. so I’m sure you won’t have trouble in finding new connections there. happy to hear you found the points mentioned in this post useful to understand better how Harleena’s community works. Wonderful website. Lots of useful information here.This post is helpful for me for get traffic. I love to see some other post from your site. I sometimes wish I had more time to dedicated to ABC but I only get to log in there once a week at the moment. We would need days with 36 hours, Dennis. Most of all on Monday! Thanks for visiting and leaving your thoughts. Have a great beginning of this week! I am big fan of aha-now dot com and love to read the article written by Harleena mam. In this guide you mentioned the all important facts and features of “aha-now community” which is really great and lots of bloggers are going to join this community after reading your article. glad you confirm my points. Thanks for visiting and leaving your views. And you are going to meet new bloggers too over there, Arsie. I look forward to interacting with you at Aha-Now Community also. I really love the engagement at Aha-Now community, Arsie. a great post about the ever wonderful web journal group. Aha!NOW group is truly useful thus giving. It is the most imperative wellspring of motivation, getting to know more companions and referral activity for me as well. building connections, getting traffic to your content. I would love to join this group! But is it not going to take hours to be an active member? I suggest you to join Aha-Now community. It takes just a few minutes to register and it depends on you, how much you want to dedicate each day/week. Even with a little time, you are going to get benefits, in terms of new connections and targeted traffic to your content. Thanks for visiting and commenting, Frank.